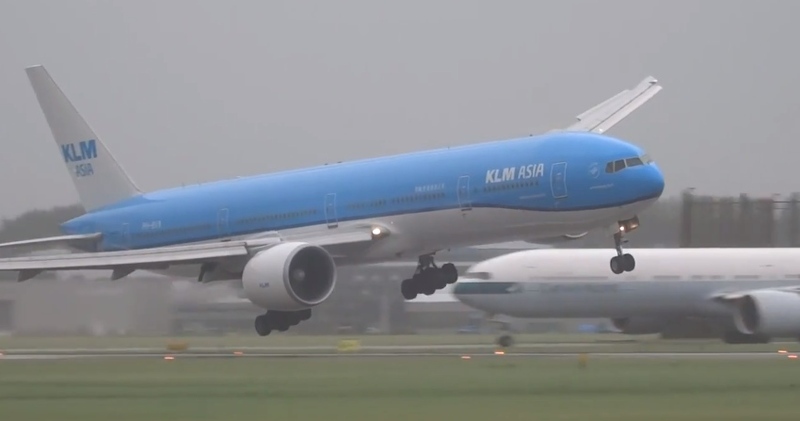 A very dramatic video of a KLM B-777 landing at Schiphol in strong crosswinds has been recently going viral on the interwebs. While the video is certainly hair-raising to most casual viewers, there are a number of things going on here that can help to explain events that can go wrong during a crosswind landing. The aircraft in the video is a Boeing 777-300 which is the stretched version of the older 777-200. This model aircraft weighs in at 370,000 lbs empty and has a max landing weight of 554,000 lbs, so we know that this particular airplane weighed in somewhere between these two numbers, more likely towards the higher number. This means that there's a lot of weight being thrown around. The video starts with the aircraft perhaps a mile or so from the runway established in what's known as a "crab". In this scenario, the fuselage of the aircraft is "windmilled" into the wind. What this means is that the heading of the aircraft is not the same as the ground track the aircraft is following. The easiest way to understand this might be to think of paddling across a moving river in a canoe. In order to reach a point directly across the river, one must "aim" the canoe at a point upstream to counter the current. Where the canoe is pointed is its "heading" and where it is actually going is its ground track. The two are not the same in a cross current (or wind). To you math geeks (and you know who you are) this is simply the sum of the two velocity vectors of the aircraft and the wind. Flying an aircraft in a crab is a standard and routine method of counteracting a crosswind on final. The problem that arises is that the aircraft cannot be landed while it is in a crab. The reason for this is that the landing gear are by design aligned with the aircraft fuselage. This means that when the wheels touch down in a crab, there will be instant skidding and dragging of the wheels across the pavement. To use another analogy, think of a stunt car doing a jump but while airborne twisting sideways. When it touches down, there will be a huge lateral force on the tires as they'd rather roll straight and not sideways. The car may even roll over. The same forces work on the airplane and put tremendous side loads on the landing gear. The landing gear for nearly all airliners are not built for such loads and could potentially collapse if landed in too much of a crab. The proper technique to land an airliner in a crosswind, then, is to make sure that the aircraft heading and hence the landing gear are aligned in the same direction as the runway before touchdown. This is done with the rudder. As the aircraft will be naturally windmilled into the wind and not aligned with the runway, downwind rudder must be applied to align the two. That means that if the crosswind is from the right, as in this video, left rudder must be applied. When this is done, however, the aircraft will then begin to be blown downwind. To counteract this tendency, aileron is then used to lower a wing into the wind which keeps the drift at bay. This technique, known as "wing low", is how most airliners must land in a crosswind. In this video, you'll see a number of airplanes landing at Dusseldorf in a strong crosswind. Some do a better job than others of both killing the drift and aligning the aircraft with the runway at touchdown. Ok, getting back to the KLM video, we can see that starting at about 13 seconds in, the pilot starts to apply left rudder to align the aircraft heading with the runway. It is especially pronounced at about 28 seconds that the rudder has almost full deflection to the left. As the aircraft continues into the flare, we see lateral rolling which becomes more pronounced until just before touchdown when a large wing drop occurs. What is happening here is that as the aircraft gets down to tree and building level, the wind becomes very unpredictable. Trees and buildings can cause a significant amount of gusting which must be quickly countered. Unfortunately, there is really no way to predict where and when the gusts will occur. While the pilot is making a heroic effort to counter each gust, there are circumstances where the situation can be made inadvertently worse by the pilot himself. This is what's known as a "pilot induced oscillation" or PIO, and it can cause real trouble if it's not recognized and corrected. where the controller and measurement boxes are the pilot, the system is the aircraft and the disturbances are the wind gusts. Such a system should be stable with the feedback serving to dampen out the effects of the disturbances (or gusts in this case). In certain circumstances, however, this is not what happens. A pilot may "over control" when making a correction causing a deviation in the opposite direction. The tendency after that is to put in an even larger correction back the other way causing an even larger deviation again. The root cause of these oscillations is the delay between the control input and the reaction of the airplane. If not caught and corrected, a PIO can and has resulted in aircraft damage and crashes. This video shows a PIO in an F-16 flown by a test pilot so you can see that it can happen to nearly anyone. In geek speak, what has happened is the "gain" is too high on the feedback loop and the system becomes unstable. The solution? In most cases, just letting go of the stick will allow the airplane's natural stability to reassert itself. So again getting back to the video, what appears to me to be happening is that the aircraft is hit with several gusts resulting in a PIO around the longitudinal axis, or the axis running from the nose to the tail. The pilot appears to be overcorrecting to each wing dip by making successively larger aileron inputs resulting in the rockin' and rollin' on short final. The largest danger inherent in lateral excursions or wing dips near the ground is the possibility of dragging an engine pod or wingtip. This is obviously a less than optimum outcome and could result in aircraft damage ranging from scraped metal as a minimum all the way up to a cartwheel and hull loss otherwise known as a crash. In this case, the dampening force that eventually quelled the PIO was the runway itself. It is difficult to determine if a go-around would have been the best course of action as a video can exaggerate the actual attitude of the aircraft. Apparently KLM management, to their credit, are backing up their pilots in this event. Landing in strong weather always entails a measure of risk above a calm and clear day. The particular challenge for pilots in such weather is not so much knowing how to fly in it as much as knowing when to abandon an approach that has gone south.